I don’t want to toot my own horn, but this really is an awesome recipe! I created it just a few weeks ago. It’s low in calories and carbs, but it’s delicious. A 25g protein sticky chocolate muffin that takes 19 seconds to cook! I’m using Chocolate Brownie flavour Impact Whey from MyProtein. You can get that in UK/Europe here. And in the US here. Soooooooo tasty. I’m not even joking. I’d love for you guys to create your own videos of you making this and then share it with me. You can let me see it on my facebook or instagram. BTW, try different flavours! I’ve also tried maple syrup and victoria sponge cake flavours – my new fav right now. 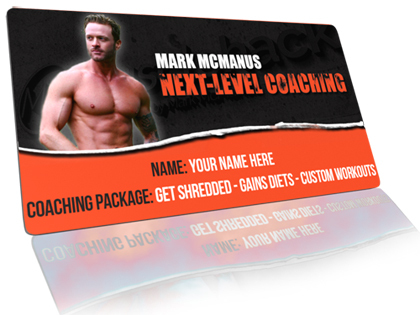 NOTE: Have you picked up my free THT training program yet? 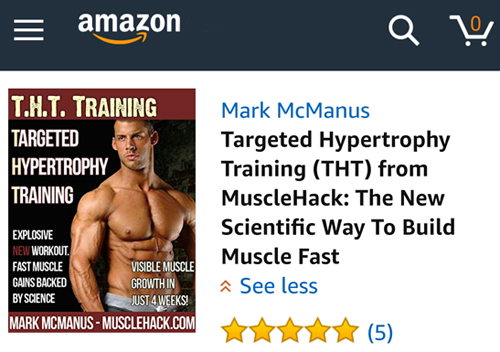 I promise fast gains and the routine comes with a free THT Exercise Bank of approved substitute exercises for ALL body parts. 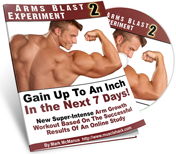 Grab the training package below and become a part of my growing community. Here’s a list of all my free recipes. 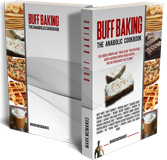 And this is my premium Buff Baking Cookbook full of great (and easy) recipes that can be used irrespective of whether you are bulking or focusing on shredding fat. Enjoy this recipe! And if you make your own video – please share it with me! Want a Great Body? Lose the Ego! What wattage is your microwave as this will affect how long you need to leave it in for? @Nick. 800W buddy. Think that’s pretty much all domestic microwaves.